The vast landscapes in Maine lent themselves to being captured in panoramic format. I don't have a wide angle lens, so I snap several photos and stitch them together using Photoshop Elements. I also use the Pano App for my iPhone. The results are not as seamless as those created in PSE, but it does the job in a pinch. 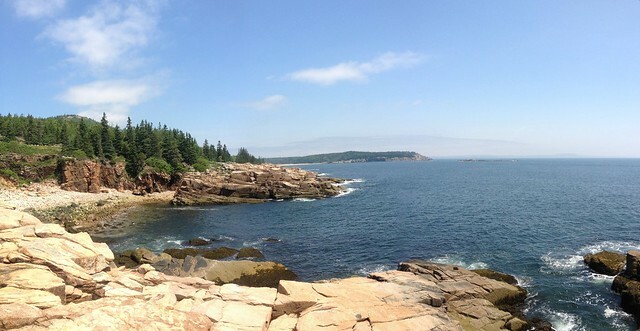 The photo used in this month's blog header was also created using the iPhone and the Pano App. I would probably get better results if I used the Panoramic camera functionality available in native iPhone camera. I guess I should upgrade to the latest iOS! I love panoramas. You stitched them together seamlessly. Beautiful Shirley! Love that panoramic view of Cadillac Mtn. That is on my bucket list to see!! I think you did a superb job of stitching photos together. I would never have known had you not fessed up to it. What a gorgeous place to spend a vacay! Absolutely beautiful shots. I am totally hooked on the panoramic feature to my iPhone 5 and if I could I would use it for everything. I am, however, disappointed with the size of images when I upload them - oh well! Good job making the panoramic photos, Shirley. Beautiful landscapes/seascape captures. Wow such a pretty area and I love the panoramas. That sunrise it spectacular. You certainly did a beautiful job with your panoramic shots...such awesome views..